Danny Lennon, the current Clyde manager. Clyde boss Danny Lennon has insisted he is happy at the League Two side despite being linked to the vacant manager's position at former club Raith Rovers. Lennon (49), is considered a Raith legend having made almost 200 appearances during the club's most successful period in the mid-1990s and was also responsible for the famous half-time scoreboard in Munich in 1995 after his free-kick put the Kirkcaldy side 1-0 up away to Bayern. 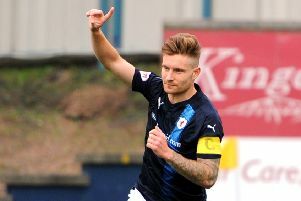 In a poll run by The Fife Free Press last week, the ex-midfielder ranked highly among the fans' choices to replace Barry Smith, who resigned from his position almost a fortnight ago following a breakdown in his relationship with the board of directors. The Raith board are due to meet tonight to narrow their list of candidates down to a shortlist, however, Lennon was giving nothing away when asked about his potential interest in the Stark's Park hot seat. "It's a compliment to be linked with any role," he said. "I had a good number of years at Raith Rovers, it's a club close to my heart where I created some great memories, but I'm in a great place at this minute in time. "I'm absolutely loving working with the chairman here at Clyde, he's the best I've ever worked for, and I'm working with some great directors and good people. "I love coming to my work on a daily basis. "Yes, I have the aspiration and the ambition to get back to full time, but why can't myself and Clyde succeed in that together?" After retiring from playing in 2008, Lennon enjoyed early success as a manager, guiding Cowdenbeath to successive promotions in his first stint in the dug-out before earning a move to Premiership side St Mirren, where he won the Scottish League Cup in 2013 following a 3-2 win over Hearts, as well as retaining the club's status in the top tier. His contract was not renewed at the end of the 2013-14 season, a move which many consider to have been a mistake on the Paisley club's part, which then led to a stint as caretaker manager of the Scotland national under-21 football team, taking charge of one match, a 2–1 victory against Hungary. His next career move was to Alloa, where he successfully avoided relegation after winning the Championship play-off final at the end of the 2014-15 season. Lennon left the Wasps after gaining just five points from their first 16 games of the following season, before returning to the dug-out for a brief spell in March 2016 as acting head coach of Airdrie after Eddie Wolecki Black suffered an illness. After 18 months out the game, Lennon returned to management with Clyde in November last year, where he has won 16 of his 35 games in charge, losing just six, and narrowly missed the promotion play-offs last season. Clyde currently sit third in the League Two table with 12 points after five games, three points behind leaders Edinburgh City.